Seventeen-year-old Christina McBurney has led a sheltered life. But when her twin brother, Jonathan, dies of consumption, Christina, unwilling to be farmed out as a nursemaid or teacher, runs away from home and her destiny. In Owen Sound she boards the Asia, a steamship that transports passengers and freight throughout the Great Lakes. She doesn't really have a plan other than to get to Sault Ste. Marie. She'll figure things out once she's settled. But a violent storm suddenly rises on Georgian Bay, and the overloaded and top-heavy steamship begins to sink. Christina is tossed overboard. Pulled to safety just before she loses consciousness, she finds herself on a lifeboat, surrounded by a number of bedraggled and terrified passengers and crew. One by one they succumb to their injuries, until only Christina and a brooding young man named Daniel are left alive. The usual rules of society no longer apply—Daniel and Christina must now work together as equals to survive. "A gripping tale that deals sensitively with the growing romance between the survivors." "Carries its weight in emotions and suspense for the reader. The novel is a great way to explore the many shipwrecks in Ontario and will engage readers who like historical fiction and survivalist themes." "Full of suspense and adventure…A memorable story." "Big Water is a gripping adventure…Curtis manages to convey the horror of the experience in a believable way, but without being overly morbid…News accounts at the time tended to focus on the boy's story rather than that of the girl. Curtis, by contrast, gives the heroine her due." "Curtis provides readers rich details of life in Victorian-era Canada…This novel adeptly combines historical fiction with a heavy dose of adventure and even some romance. A must-buy for where Victorian-era historical fiction or survivor tales are popular." "Curtis has managed to engage the complex subject matters of mortality and grief in a surprisingly accessible and appropriate manner for young readers. Her philosophical observations on the topic manage to provoke thought and lend themselves well to the profundity of the historical event and the fictional representation. Curtis also throws in allusions to the poems 'Rime of the Ancient Mariner' and 'Kublai Khan' by Samuel Taylor Coleridge, again demonstrating the intelligence behind this book, and its homage to romanticism and human virtue. 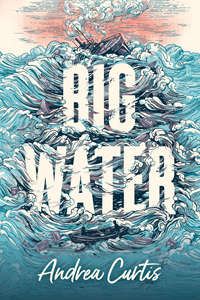 Big Water is an excellent read for young readers and adults alike." "This story offers an interesting look at a piece of history and a compelling disaster narrative. The author taps into feelings not just of terror but determination and self-reflection, as Christina fights for her life in an increasingly grim lifeboat. A partnership with her fellow survivor helps move the plot along, and a mystery around his life adds some intriguing historical context…Curtis' novel will make an exciting read for any historical-fiction fan." "A riveting story of survival, friendship, and the power of the human spirit." "Curtis' choice of the present tense brings immediacy, allowing readers to feel that they are going through the ordeal hand in hand with Christina. Presenting the story through Christina's stream-of-consciousness brings the story 'up close and personal' and allows readers to share Christina's thoughts, fears and memories as they occur to her. Recommended."